This page (together with the documents referred to on it) tells you the terms and conditions on which we supply any of the products (“Products”) listed on our website www.glassfurniture.co.uk (“our site”) to you. Please read these terms and conditions carefully before ordering any Products from our site. They do not affect your statutory rights. You should understand that your continued use of this Website constitutes your agreement to be bound by these terms and conditions which shall govern all transactions on our site to the exclusion of any other terms and conditions. You should print a copy of these terms and condition for future reference. www.glassfurniture.co.uk is a site operated by Klarity Glass Ltd. Our main trading address is Unit 5 Alexanders Wharf, Lifford Lane, Birmingham, B30 3DY. You will not have the right to cancel a Contract for the supply of an custom-made, made-to-order or bespoke items. Please review our Privacy Notice, which also governs your visit to glassfurniture.co.uk, to understand our practices. When you have items in your basket on the left you can click checkout to proceed and buy your chosen items. glassfurniture.co.uk site is operated through a secure “https” connection. See site security for more information. We take payment using PayPal. If you don’t have a PayPal account you can still pay by your usual debit or credit card. To process the payment at PayPal we will direct you automatically to the PayPal website. At the end of the transaction you will be able to return to this website. For goods ‘made to order’ (which includes most items on our website) or ‘bespoke’ Klarity Glass Ltd are not be able to make changes to orders, make a refund or exchange any item. These items are considered custom-made and personalised items. You should only order if you are sure that the item and finish is right for you. You will not be able to change the order after it has been placed. Also you should be careful to check access to your property; delivery is on the basis that you have checked the dimensions of the item and that it fits through all doorways, stairwells and within the area of intended use. We have no liability for items ordered that a customer no longer requires. Once an order has been processed the customer is liable to purchase the items. Please inspect your items immediately upon receipt. All items should be inspected with the delivery team wherever possible. If your item(s) is/are damaged in transit/upon receipt of goods and you have not been able to report this at time of delivery – you need to contact us within 24 hours of receipt, sending photos of any damage. No claim for replacement can be made after 24 hours. Any claim regarding damaged or defective furniture must be made initially by telephone or email. Our team will assess the damage and if approved will order you a replacement or repair (where applicable). The damaged item/s must be returned to Klarity Glass Ltd within 14 days. The cost of returning the product(s) will be your responsibility and you must insure the transit of the products. Where items are large or fragile (as determined by Klarity Glass Ltd) we reserve the right to nominate a specialist delivery team for return of goods and pass the cost of delivery (Minimum charge of £85) onto the customer. In all cases the product(s) must be adequately packed and in the original packaging to prevent further damage. You must clearly state the invoice number provided by Klarity Glass Ltd on the package so that we can identify the product on return. Where items are large or fragile (as determined by Klarity Glass Ltd) we reserve the right to nominate a specialist delivery team for return of goods and pass the cost of delivery (Minimum charge of £85) onto the customer. Variations: In pursuit of the manufacture of the highest quality products, and customer service, the manufacturer reserves the right to modify colors, dimensions and type of construction at any time. Tolerance: Colors, finishes, fabrics and other materials are shown as an indication only. 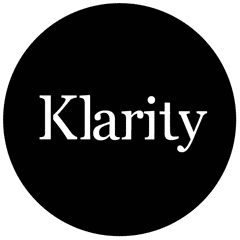 While great effort has been made to represent products truthfully, neither the manufacturer, nor Klarity Glass Ltd is responsible for errors or omissions. Many products in this price list are made by artisans. Dimensions shown therefore must be considered indicative. Materials may show imperfections. These are usually natural or the result of an artisanal production process and should be considered a sign of authenticity and does not affect the quality of the item; this can include small bubbles seen around the area of UV bonds. Some of the products supplied by Klarity Glass Ltd may show a toughening stamp or other discrete manufacturing stamp due to relevant standards. Toughened glass is approx. 5-6 times stronger than normal glass and in case of breaking it crumbles in tiny harmless pieces. It is feature of the toughened transparent glass, particularly with thicker float glass, to present streaks and iridescences (due to the thermal processes during the toughening) which are only visible in back-lit or at certain angles in particular lighting conditions. This feature can not be considered as a reason for complaint. Humidity and the air salt content can oxidize the silver plating of the mirror and stain it. The arising of these stains can not be reason for any claim. Wood appearance: We supply high quality furniture grade wood. This may vary for grain, colour, knots and other markings. We do our best to select and match as appropriate but we cannot accept returns on the basis of natural variations. Any special requirements for colour, matching, etc. must be provided in writing. Wood warpage, shrinkage, and dimensional changes: Wood is an active material, in that it is known to have dimensional changes depending upon moisture, temperature, humidity etc. We purchase and supply furniture high grade wood which has been dried to correct moisture content but sometimes warpage, shrinkage etc, can still occur, especially when the furniture is shipped to drier climates from where it was made. We will accept returns if the timber was not appropriately dried but we cannot accept returns that stem from climactic differences. Should movement occur in the wood addressing issues of temperature and moisture usually resolves the issue. Unless we agree otherwise in writing, delivery of the Products shall take place at the address specified by you when placing the order for the Products. We reserve the right to charge an additional amount for areas such as Scotland or area outside of UK mainland. Should you place an order before a shipping quote has been issued you will be contacted by one of our sales team who will inform you of any additional shipping charges if applicable. Please be aware that although our delivery drivers take every care when delivering your products, we cannot be held responsible for any damages that occur to your property or possessions whilst the delivery is in process. It is your responsibility to take every care to cover any carpets or furniture and remove any valuables, including pictures, from the delivery area. Klarity Glass Ltd offers free storage for 7 days following notification of intention to deliver. If storage is required beyond 7 days a holding fee of 5% of the overall sale total for each week over the initial 7 day period maybe be charged. We are under no obligation to provide the Product to you at the incorrect (lower) price, even after we have sent you a receipted Invoice , if the pricing error is obvious and unmistakable and could have reasonably been recognised by you as a miss-pricing. Payment is accepted by credit or debit card for all Products. We accept all major card payment methods payment through Paypals secure servers. If you wish to pay by other methods e.g. BACS or cheque please call our office. No payment shall be deemed to have been received until we have received the payments in cleared funds. When you visit glassfurniture.co.uk or send e-mails to us, you are communicating with us electronically. You consent to receive communications from us electronically. We will communicate with you by e-mail or by posting notices on this site. You agree that all agreements, notices, disclosures and other communications that we provide to you electronically will satisfy any legal requirement that such communications be in writing. All notices given by you to us must be given to Klarity Glass Ltd, Unit 5 Alexanders Wharf, Lifford Lane, Birmingham, B30 3DY. Notices can also be presented via email info@glassfurniture.co.uk . We may give notice to you at either the e-mail or postal address you provide to us when placing an order, or in any of the ways specified above. Notice will be deemed received and properly served immediately when posted on our website, 24 hours after an e-mail is sent, or three days after the date of posting of any letter. In proving the service of any notice, it will be sufficient to prove, in the case of a letter, that such letter was properly addressed, stamped and placed in the post and, in the case of an e-mail, that such e-mail was sent to the specified e-mail address of the addressee. We will not be liable or responsible for any failure to perform, or delay in performance of, any of our obligations under a Contract that is caused by any act, event, non-happening, omission or accident beyond our reasonable control including without limitation, as a result of Act of God, war, strike, lockout, labor dispute, fire, flood or drought (Force Majeure Event). All content included on this site, such as text, graphics, logos, button icons, images, audio clips, digital downloads, data compilations, and software, is the property of glassfurniture.co.uk or its content suppliers and protected by United Kingdom and international copyright laws. The compilation of all content on this site is the exclusive property of glassfurniture.co.uk and protected by U.K. and international copyright laws. All software used on this site is the property of glassfurniture.co.uk or its software suppliers and protected by United Kingdom and international copyright laws. Glassfurniture.co.uk is a registered trademark and may not be used in connection with any product or service that is not Glassfurniture.co.uk’s, in any manner that is likely to cause confusion among customers, or in any manner that disparages or discredits glassfurniture.co.uk. All other trademarks not owned by glassfurniture.co.uk or its subsidiaries that appear on this site are the property of their respective owners, who may or may not be affiliated with, connected to, or sponsored by glassfurniture.co.uk or its subsidiaries. If you use this site, you are responsible for maintaining the confidentiality of your account and password and for restricting access to your computer, and you agree to accept responsibility for all activities that occur under your account or password. glassfurniture.co.uk and its affiliates reserve the right to refuse service, terminate accounts, remove or edit content, or cancel orders in their sole discretion. Visitors may post reviews, comments, and other content; send e-cards and other communications; and submit suggestions, ideas, comments, questions, or other information, so long as the content is not illegal, obscene, threatening, defamatory, invasive of privacy, infringing of intellectual property rights, or otherwise injurious to third parties or objectionable and does not consist of or contain software viruses, political campaigning, commercial solicitation, chain letters, mass mailings, or any form of “spam.” You may not use a false e-mail address, impersonate any person or entity, or otherwise mislead as to the origin of a card or other content. glassfurniture.co.uk reserves the right (but not the obligation) to remove or edit such content, but does not regularly review posted content. If you do post content or submit material, and unless we indicate otherwise, you grant glassfurniture.co.uk and its affiliates a nonexclusive, royalty-free, perpetual, irrevocable, and fully sublicensable right to use, reproduce, modify, adapt, publish, translate, create derivative works from, distribute, and display such content throughout the world in any media. You grant glassfurniture.co.uk and its affiliates and sublicensees the right to use the name that you submit in connection with such content, if they choose. You represent and warrant that you own or otherwise control all of the rights to the content that you post; that the content is accurate; that use of the content you supply does not violate this policy and will not cause injury to any person or entity; and that you will indemnify glassfurniture.co.uk or its affiliates for all claims resulting from content you supply. glassfurniture.co.uk has the right but not the obligation to monitor and edit or remove any activity or content. glassfurniture.co.uk takes no responsibility and assumes no liability for any content posted by you or any third party. All items purchased from glassfurniture.co.uk are made pursuant to a shipment contract. This means that the risk of loss and title for such items pass to you upon our delivery to the carrier.